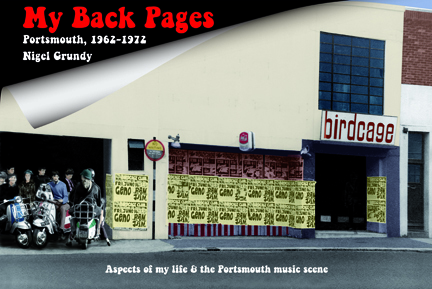 An A5 format book of 342 pages containing over 600 monochrome photographs and images, mostly of the 1960s Portmouth music scene. With a foreword by Dave Allen, this largely autobiographical book covers ten years of the author’s life in Portsmouth from 1962 – 1972. 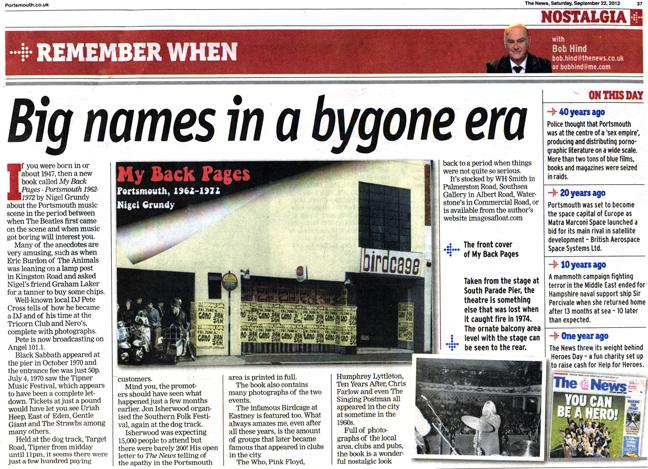 During that time he was involved with the Mod and Hippy scenes and photographed many of the top local and national bands, including Pink Floyd, Black Sabbath, Arthur Brown, Sandy Denny and others who visited the city’s music venues from Portsmouth Guildhall to the Indigo Vat, a small cellar club in Hampshire Terrace. 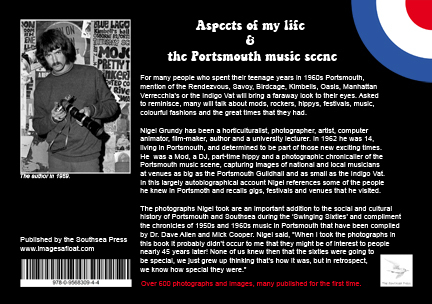 The book includes photographs, people and places the author knew and also interesting reminiscences from some of the musicians who played in local Portsmouth bands during the 1960s. Emails from some of the people who bought the book. 'I think it is absolutely great. I've only scratched the surface but it has already bought back all sorts of happy memories about things I had completely forgotten about. The book is such a gem as I knew a lot of the people, places and incidents you talk about. Portsmouth during those times in the sixties when we were just beggining to enjoy a little adolescent independance was such an exciting place to grow up. It was a small enough city and the places to hang out were relatively few but exciting and there was a real spirit of togetherness amongst the people of our age (except when the fights used to break out at the Birdcage or along Pamerston Road!). Greg Smith, The British Music Archive. Phil Freeman, singer with 1960s band Image and sound and light technician for Gentle Giant. Ray Shulman. Multi-instrumentalist, Simon Dupree and the Big Sound & Gentle Giant. 'Read your book in one go on Monday. Found it very much unputdownable and it revived so many memories - The Peter Pan shop, Verrecchia's, The Woburn music festival (I can remember going there but can't remember how or where we slept) etc, etc. Your photos are stunning too - makes you realise how many of the top bands played here. 'We've spent the last couple of hours grabbing the book from each other saying "do you remember when...." and " I was there...."
Very many thanks for the book which arrived today, Friday. That’s a great service, many thanks. What a wonderful book. I only lived in Portsmouth for a couple of years, 1964/65, but there was such a great music scene there at the time, it brought back so many memories and so many familiar names. Funny how the memory works: I vividly remember going into the coffee bar with booths, near the Guildhall, but the name Verrecchia’s means nothing to me at all. I was very pleased to see photos of my old mate John Morgan on page 270/271. I played with him in a purist blues band called JM Blues, in Devon, in the late 1960s, before he formed Spirit of John Morgan. Anyway, once again, very many thanks for the book; I shall now read it in detail. At the book launch Nigel Grundy and his friend Morley Stewart-Jones, who is also in the book, were interviewed on Radio Solent by presenter Alex Dyke. Below is a transcript of a rather delightful exchange. Morley: Are you saying we haven’t now? Alex Dyke: Yes I am, I think the wives in the studio look really good and they have made a bit of an effort. Nigel looks like a cross between an old press photographer, well past his best, crossed with Columbo, that would be fair wouldn’t it? Alex Dyke: Morley’s laughing, but he looks no better, he’s wearing a denim shirt – an inexpensive denim shirt. Alex Dyke: Well yeah, but it doesn’t really look like M&S - and a really old 80s leather jacket and he looks like he’s come out from a repeat of Bergerac. So that’s what they look like in case you’re wondering, but don’t even think about that, when you buy My Back Pages just enjoy them looking gorgeous in all that 60s gear.